It’s AFL footbal finals time in Melbourne so in Epicure today I put the spotlight on what players eat and how that compares to the 1970s and 80s. 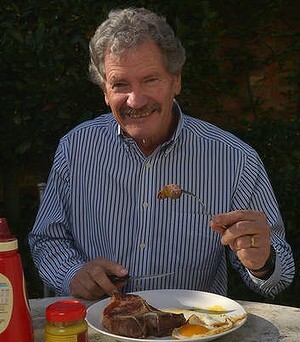 It was a pleasure chatting to former Richmond great Barry Richardson about the big hairy steaks he and his teamates ate just three-and-a-half hours before each MCG game (some of the players who boarded at Punt Road would eat one for breakfast too). It was also interesting to talk to several current and former AFL dietitions including Karen Inge (she was at Collingwood and Hawthorn in the 1980s) and Lorraine Cullen from Sydney FC, who provided some handy tips for kids on what to eat before Saturday sport. Read the full story here or see Lorraine’s tips below. Pasta with lean mince bolognese, a green salad, and crusty, wholegrain bread. Then, for dessert: ice-cream and fruit salad. Chicken and pumpkin risotto with a side of green vegies. Then, for dessert: fruit crumble and custard. Porridge with honey and mixed berries, and two slices of toast with Vegemite. To drink, she suggests 200ml fresh orange juice and 500ml water. Fruit salad and natural yoghurt with honey, and two poached eggs with two tablespoons of baked beans on two slices of toast. To drink, she suggests 200ml fresh orange juice and 500ml water.